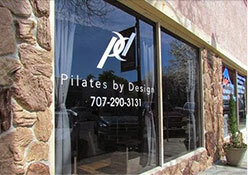 At Pilates By Design we aim to create a safe, fun and focused environment in which to exercise. We want our clients to get the most out their experience so we have guidelines that we ask everyone to follow so that all who come through our doors gets an amazing, uplifting fitness experience! Please enter studio quietly and speak at a low volume while you wait for class. We want to assure that those currently taking class can maintain focus throughout the entirety of their workout. Please wait for class in the designated sitting/waiting area. Do not get on or approach the equipment until the previous class has finished with instruction and everyone is done wiping their machines. Wait for them to leave the equipment space. Treat others taking class as you would like to be treated if you were taking class! All of your belongings are to be stored in the cubbies. It is a safety hazard for both instructors and clients to have your belongs near the equipment. Clothing with zippers is not to be worn when using the equipment. 24 Hour cancellation notice is required. You will be charged for the price of a missed class. Please let your instructor know of all your injuries or concerns prior to class. The instructors cannot help or modify if they are not aware! Your session can be very successful when we are fully informed! Our ultimate goal is to help you maximize the effect of your workout. After 3 No shows you will be removed from a regular spot if you are bulk enrolled. Be respectful of others’ time, show up on time and ready to work out. Make sure the volume on your phone is turned down upon entering the studio. It is okay to keep your phone with you but please minimize the disruption. Wear appropriate attire for exercising. No jeans, shoes or accessory jewelry. Please minimize use of lotion prior to class as it becomes a safety hazard. Please be as independent as possible with scheduling and cancelling yourselves. We have a brand new website with better access to our schedule. If you cannot do this yourself, please text 707-290-3131 for assistance. Emails will have a slower response time. Some people may have to call and that is fine as well. If you are moving yourself to a different time on the SAME day please let the instructor know so we can undo any unnecessary charges to your account. At Pilates by Design we believe Pilates is a gateway to enhance your quality of life both physically and mentally.